This article is dedicated to a man whose wife doesn’t live with him because of disagreements over WMSCOG involvement. May she come home soon. The Mystery of God and the Spring of the Water of Life, or better known as “The Green Book”, is a book read in the WMSCOG written by Ahn Sahng-Hong, a man they incorrectly claim to be the Second Coming of Jesus Christ. Since Ahn Sahng-Hong is their false god, this book effectively serves as an addendum to Holy Scripture, much like the Book of Mormon. So if God writes a book, do you think that book should change over time? It’s reasonable to have minor translation differences between languages, but what if the changes were not simply translation differences? What if they removed certain paragraphs entirely? What if those paragraphs that were removed just happened to testify against what they teach now? It’s interesting to note the parts of the book which were removed were the ones that did not come true. 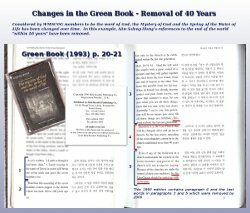 The world did not end within 40 years of Ahn’s prophecy, and those prophecies subsequently disappeared from his writings in the Green Book read in the WMSCOG. To those who believe in Ahn–any explanation is good enough, to those who do not–no explanation is necessary. Have something to say? Comment below, or start a discussion in our forum. Hello Ronelle and thanks for commenting. Your situation sounds very familiar unfortunately. Please continue to do your research and spend some time away from the group so that you can have the opportunity to really think things through. Follow your intuition. Wish i’d read this back in April. Got baptised right before Passover. My daughter got baptised too, soon after. She was so excited at first. 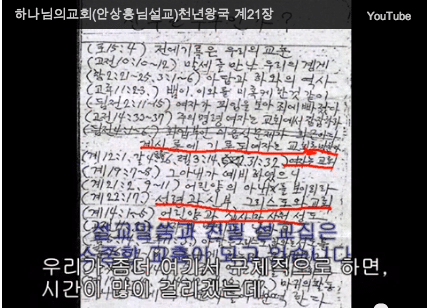 We were not told about AhnSahngHong or Mother until a while after we joined. We sorta had to figure it out on our own. We just thought A.S.H. 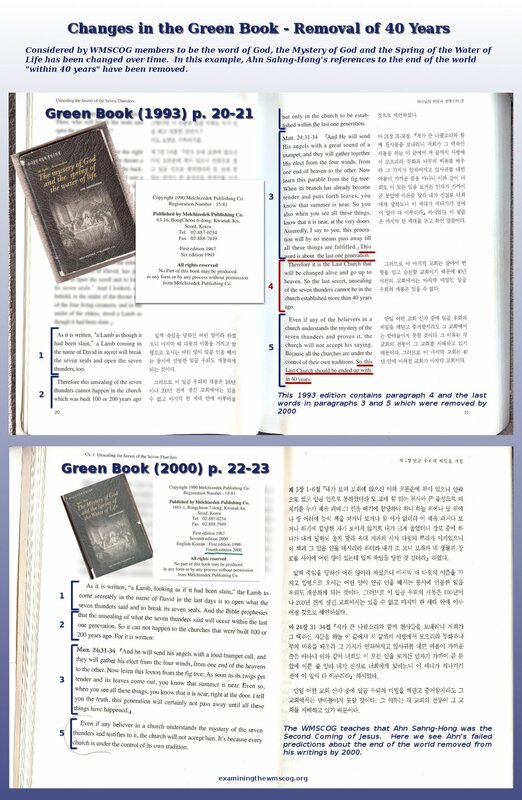 was another name for Christ in Korea. I couldnt even get the full name of the church out of anyone, so i couldnt check it out online. We were told in a sermon not to go to the Saggices to learn about the Pharises, or the Dallas Cowboys to learn about the Redskins. Of course theyre going to say bad things, theyre enemies. So, i didn’t look. 2 days ago i thought i was amazed by the truths taught to me in the bible, but then i decided to see what the internet said. Holy Guacamole! I talked to my daughter tonight. She was very confused and this website helped me explain to her. I read some parts to her from it. She isnt as upset as i am. She hasn’t spent 6 day weeks in church learning to teach false bible studies. I wanted an Apostolic Age church. I thought the modern church had really gotten away from Christs teachings. This answered my need. Now where do i go? I still wish to keep biblical Sabbath and participate in the new covenant of Passover. I am very sorry to hear about your experience. i am also sorry that you were not better informed about who Ahn Sahng-Hong is. 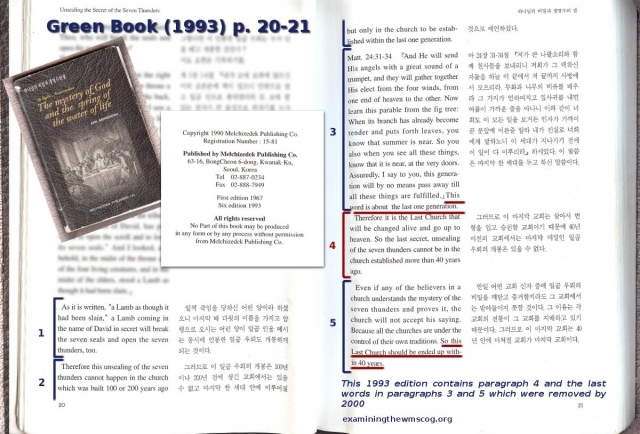 He was a Korean man who split off from the SDA movement to form his own flavor of church. He never claimed to be Jesus, but the WMS claims he was. The WMS themselves are a split off of the NCPCOG ( http://www.ncpcog.co.kr ). 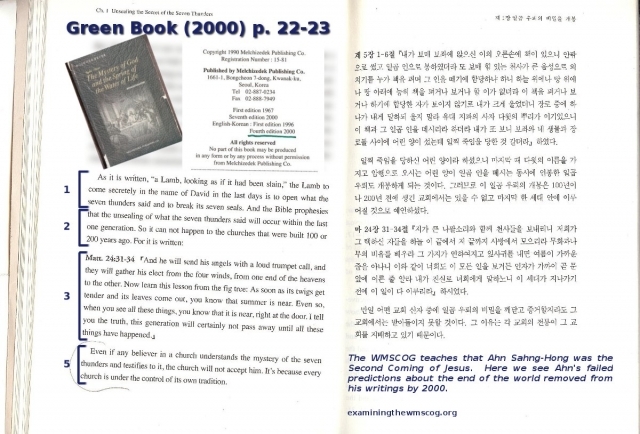 The “mother” is a Korean woman named Zahng Gil Jah. This sort of new religion seems very common in Korea. I am sorry you have been misled. I just want to give a suggestion to the former members of the wmscog that are having confusions of what they are going to do now. It is hard finding out that the very things you honestly wanted to believe in are just false man-made teachings. If you are a bible believer, then please just read the bible. It is such a cliche but most of the people that were easily deceived by the wmscog are those who does not have enough knowledge on the bible. Other religions can’t really help you find your faith, but if you want guidance in reading the bible, I would suggest that you find a religion that practices a “sola scriptura” (from the scriptures only) teaching since many religions today have inserted their own traditions and beliefs in their religious practices. The reason all these former members say they don’t know where to go after coming out of the WMSCOG is because the WMSCOG has thhe perfect truth of God. 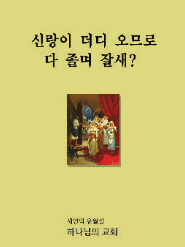 I know this website has lots of topics against Father Ahnsahnghong, but all these things have answers. You fools! Why do you stand against God amidst all the prophecies? If there was Judas Iscariot in the age of the Christ. How much more in this age? Stop playing the Role of the betrayal and seek to understand God. You will truly suffer the cup of the wrath of Christ if you continue in your ways.